This is my first CD, released in July 2012 on the Canadian Music Centre’s Centrediscs label. Colin Eatock: Chamber Music (CMCCD 17812) is a collection of half a dozen pieces I’ve written over the last 25 years, for small combinations of voices and instruments. It is my finest hour! These works are presented in studio recordings by 15 musicians: soprano Melanie Conly, mezzo Anita Krause, bass-baritone Andrew Tees, clarinetist Peter Stoll, violinist Laurel Mascarenhas, cellists Karl Konrad Toews and Thomas Wiebe, members of the Niagara Brass Ensemble, harpsichordist Ian Robertson, and pianists Kate Carver, Peter Longworth and Timothy Minthorn. The manufacture of this CD was generously supported by a donation to the Canadian Music Centre from Roger D. Moore. 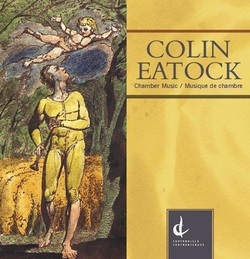 Colin Eatock: Chamber Music may be ordered through Amazon.com, here. If you’d like to hear sample tracks from this CD, click here or here. To see a promotional video for the disc, click here.